US Netting is exceeding client demands with new add-on guardrail for the defender gate. Erie, Pennsylvania - February 2017 US Netting designed the Ultimate Defender Gate with one goal in mind. Stop forklifts from falling off of loading docks. Following their clients demand to protect from crawl throughs, slips and falls underneath the gate. US Netting designed the Ultimate Plus Guardrail add-on to solve this dilemma. “It is important to have an open line of communication with our clients. As a player in the safety industry, the end-user is the most important factor in the equation” stated President, Paul Galla. 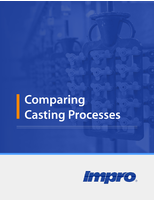 “Fortunately for us, we have the capability to customize our product line at any point. No two docks are the same, and we can account for that in-house,” he added. 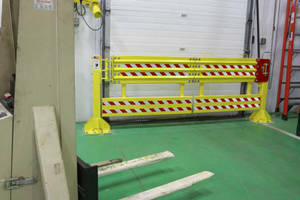 The Ultimate Plus Guardrail bolts directly into the Defender Gate Ultimate safety gate to offer added protection. If you order the Ultimate Plus with the add-on guardrail, the system will come pre-installed on your gate. Production Lead Jim Risenweber said "We are always excited to make our products stronger. 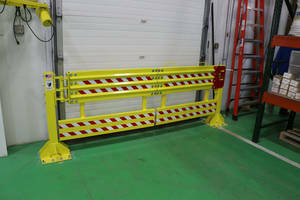 There is something to be said for knowing you have the toughest safety gate on the market." Although, an installation may not be necessary if you don't already own the Ultimate Defender Gate. 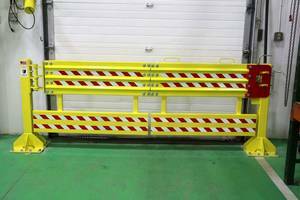 Any Ultimate Defender Gate purchased with the additional guardrail will ship with the rail already installed for ease on your end. Each gate undergoes a multi-point inspection by our quality assurance department. Our QA team ensures that each gate will fold, the latch is working, all necessary parts are ready to go. US Netting aims to avoid accidents on and around loading docks. 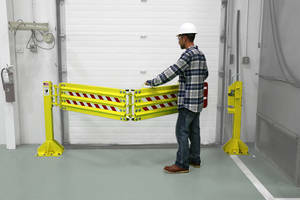 The Ultimate Defender Gate Plus focuses on extending that safety. 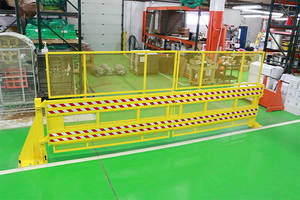 Keep your loading dock the safest in the world with loading dock solutions from US Netting. If you have questions regarding the Ultimate Defender Gate Plus or any of our product lines, visit us at usnetting.com email us at sales@usnetting.com or call us at 1-800-331-2973.